The electric forklift market is growing significantly from decade owing to its applications in relevant industry, providing cost efficiency and improved productivity. The electric forklifts are actively adopted across the globe resulting in the quantitative increase in demand which in turn pushed the year-on-year revenue growth. Stringent emission norms for diesel vehicles across the globe in order to regulate the CO2 emission have led the manufacturers to offer more environment friendly forklift truck models. Moreover, manufacturers have adjusted the direction of their R&D activities, increasing the proportion of developers working on electric forklifts and warehouse forklifts, in order to expand the electric and warehouse product lines. High adoption of electric forklifts owing to its advantage over IC powered forklifts and continuous expenditure over advancement of battery technology is anticipated to accelerate the growth of electric forklifts in coming years. Goldstein Research analyst forecast the global electric forklift market to expand at a CAGR of 7.1% during the forecast period 2016-2024. Further, the market is anticipated to reach USD 39.4 billion by the end of forecast period. Based on product type, counter balanced forklift trucks accounted for the largest revenue share of 55% in global electric forklift market in 2016. On the other hand, warehouse forklifts are the fastest growing owing to rising ecommerce business across the globe which is likely to expand at a CAGR of 9.1% over the forecast period i.e.2016-2024. Geographically, Asia Pacific region accounted for the largest market share with 35% revenue share in global electric forklift truck market. Asia Pacific region is closely followed by Europe and is likely to expand at a CAGR of 6.6% over the forecast period i.e. 2016-2024. The major countries of Latin America such as Brazil and Mexico showcase huge opportunity for electric forklift truck industry as these countries are showcasing positive growth in manufacturing and automotive industry growth. According to our electric forklift market study on the basis of extensive primary and secondary research, one major trend in the market is technological advancement to achieve longer battery backup and higher power output. For instance, recently HELI has launched a new heavy duty electric forklift trucks with a loading capacity up to 10 tons. These forklifts are attracting some industries for applications from general manufacturing, logistics and warehousing, to many more outdoor uses. According to the report, major driver in global electric forklift market is growing e-commerce business across the globe. The rapid growth of online retail sales has seen consecutive years of growth around the world, with international trade increasing, which significantly boosted the logistics and warehouse activities. Amplified warehouse spaces strive to work quickly and efficiently to meet the market demand, which is significantly pushing the demand for efficient electric forklift trucks for warehouses. Further, the report states that one challenge in global electric forklift truck market is the disadvantages of forklifts over IC engine powered forklifts such as longer battery charging time and lower power output as compared to the conventional forklift trucks. The report covers the present ground scenario and the future growth prospects of the electric forklift market for 2016-2024 along with the total revenue of electric forklift truck industry in every region. We calculated the market size and revenue share on the basis of revenue generated per segment, regional, and country level. The revenue forecast is given on the basis of number of forklift manufacturers and current growth rate of the market. Electric Forklift Market Report has been prepared based on an in-depth market analysis from industry experts. The report covers the competitive landscape and current position of major players in the global electric forklift market. The report also includes porter’s five force model, SWOT analysis, company profiling, business strategies of market players and their business models. Thisreport also recognizes value chain analysis to understand the cost differentiation to provide competitive advantage to the existing and new entry players. 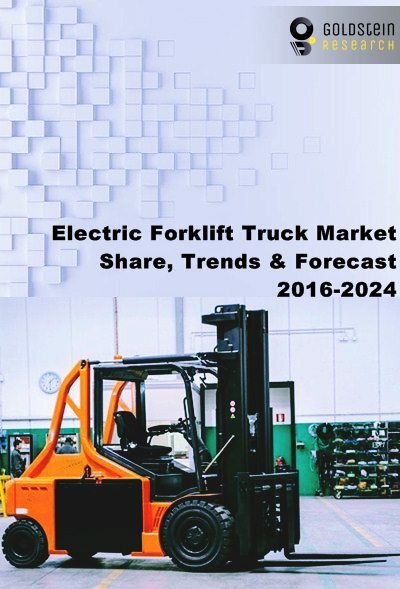 Moreover, the report comprises of the following companies as the key players in the global electric forklift truck market: Jungheinrich Lift Truck Corp., Kion Group AG, Toyota Industries Corp., Hyster-Yale Group, Anhui Forklift Truck Group Co. Ltd, Clark Material Handling International Inc., Combilift Ltd., Crown Equipment Corp., Doosan Industrial Vehicles Co. Ltd, Godrej & Boyce Mfg. Co. Ltd, Hangcha Forklift Co. Ltd, Komatsu Utility Co. Ltd, Hangcha Group and Mitsubishi Forklift Trucks. For a full detailed overview, send request for market report sample. 8.2.2. Jungheinrich Lift Truck Corp.
8.2.7. Clark Material Handling International Inc.